I was watching this week's Aisle Say (thank goodness for archives! ), as Hap expounded on the issue of extreme niche theatres: specifically, The Women's Theatre Project, and their decision to produce only all-female cast shows. They were really discussing the recent study which revealed that not only are women playwrights really not produced as much as men, but that women are less likely to select a play by a woman for production. It was a great discussion, with playwrights Andi Arthur and Terry Lawrence going over the pros and cons - and prose - with Bill Hirschman and Hap Erstein. The Women's Theatre Project, of course, is dedicated to producing plays by women, but they also only cast women, which means they only produce scripts where all the characters are female. Hap thought that this was going a step too far; not all plays written by women feature only women. He used Wendy Wasserstein as an example: with this limitation in place, only one play in her canon could be produced at TWTP. "That seems unnecessarily limiting," he argued. There was a time I might have agreed with Hap. But that's before I learned about Chuck Close. 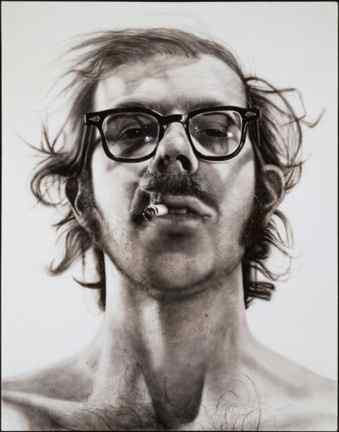 A few years back, I had the chance to sit in on a lecture by Chuck Close, recognized as "a living master" painter. He was talking about how he got started, and how he had an epiphany that allowed him to unlock his full creative potential. He did it by extremely sharp limits on his work. "Back when I could do anything I wanted, any way I wanted, I couldn't really decide what to do or how to do it. But once I set rules, once I imposed boundaries on myself, I was free to paint as much as I wanted within those limits. It freed me." He would do photo-realistic paintings. He would only work in black and white. every unit must have an absolute value of either black and white. Here is an example of his black and white painting technique: his self portrait from 1967, the first of the series. This is a painting, not a photograph. And there is not a single drop of gray paint on it. It's also quite large: it's nearly 9 feet tall by 6 feet wide! Eventually, he did allow himself to use colors, but even those would have strict limits to use. But even though the rules were strict, they were few enough that he was able to accomplish a great deal. So contrary to popular belief, limits are good, not bad. Another thing to consider is that we are in the age of niche theater. When I started out, regional theatres were trying to be all things to all people: Actors' Playhouse was the last theatre locally to focus on this kind of programming, the "mixed bill." They tried to appeal to everyone: a comedy, a family musical, a drama, a big musical spectacular, and a thriller. Not necessarily in that order. And that works fine when you're the only theater in the county. We have over 35 theatres in the three counties comprising South Florida. And let's face it, not everyone is good at everything. It may be talent, it may be perspective, it may simply be resources, but some theatres were always stronger in some genres than others. The modern approach is for a theatre to define a niche for itself: Florida Stage started this trend in South Florida, dedicating itself exclusively to new works, preferably premieres. GableStage has built its reputation on drama, particularly recent hits from Broadway, Dramaworks does more classic plays, MadCat tends to develop scripts from scratch. Even Actors' Playhouse has been tending to produce musicals exclusively, playing to their strengths. And that's really what "niche theatre" is about: focusing on a specific form in order to discover and develop the tools to fully explore and fully realize the scripts being produced. Thus The Women's Theatre Project actually suits the age of the niche theatre perfectly. So they will only produce plays by women, and featuring only women. As strict as those rules are, they leave a lot of room to explore; they don't exclude older plays, foreign works, adaptations, or even set specific genre. Granted, there may not be that many other there, but there are a few. And anyway, the real point of TWTP is to give women a forum where their voice isn't fighting for a presence.